Michelle Paris, DC founded RejuvaWell in concert with highly trained specialists to address choices and solutions in aging that integrate both health and wellness with aesthetics. The idea that anti-aging and functional/integrative medicine are independent are separate disciplines runs counter to everything we know about overall health. Whole Family Chiropractors, also founded by Dr. Paris has also been in the Mueller community since 2009. We are proud to partner with RejuvaWell. Our chiropractic patients now have the ability to have direct access to medical visits, labs and regenerative health and our RejuvaWell patients have easy access to chiropractic and massage. Of course, skin care and aesthetics are always available. Dr. Merrick Fisher and Dr. Brian Gore have been an integral part of the team for over 2 years. The three docs review all cases and help create a coordinated plan for care. According to the American Chiropractic Association website, “Chiropractic is a health care profession that focuses on disorders of the musculoskeletal system and the nervous system, and the effects of these disorders on general health. Chiropractic services are used most often to treat neuromusculoskeletal complaints, including but not limited to back pain, neck pain, pain in the joints of the arms or legs, and headaches.” The three doctors work together and with the clinical therapists to help correct and maintain even the most complex bodies! 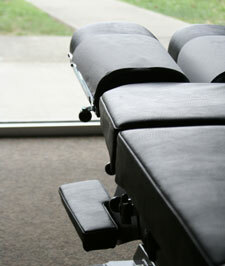 If you’ve been searching for a safe, effective and natural form of health care, consider chiropractic care. Dr. Paris and her colleagues are trained in an array of adjusting techniques that can help with back pain, neck pain, headaches, sciatica and so much more. Their techniques include Diversified, Chiropractic BioPhysics®, Flexion-Distraction, Activator®, Neuromechanical Impulse, Drop Table, B.E.S.T. and/or Sacro Occipital Technique®. All are designed to relieve pain, restore function, promote biomechanical optimization, establish stabilization and encourage normalized function. The doctors at RejuvaWell get to the source of your problem and get you the results you desire.